Sock Fancy vs. Foot Cardigan: which is the best sock of the month club? Sock Subscriptions are clearly one of the most popular ways to keep your sock drawer looking fresh on a monthly basis. And of course, everyone loses socks all the time, so sock of the month clubs make it easy to never run out of socks! Also, when you subscribe to a fun sock of the month club, the designs will be unique, making it super easy to pair your socks together. Two of the most popular sock of the month clubs are Sock Fancy and Foot Cardigan. In this post, we are going to compare the sock subscriptions offered by Sock Fancy and Foot Cardigan. Foot Cardigan is known for its fun brand. They even have a “Footsies Podcast” which is a fun podcast hosted by the founders of the company. Foot Cardigan socks are made under their own brand and come in all sorts of designs and patterns for both adults and kids, and men and women.Sock Fancy is similarly known for its fun brand of socks, but they present the brand with less humor and more about fancy style and flare. They carry only adult socks for men & women. You can browse their gallery to see some of their latest styles, or even check out some of the Sock Fancy images we compiled on Instagram. 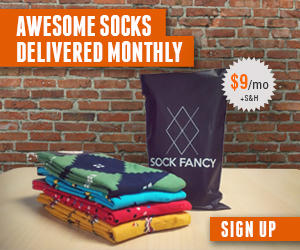 Foot Cardigan ships a single pair of socks on a monthly basis. Before each shipment, you can choose which pair of socks you want.Sock Fancy gives you the option of receiving either one pair or two pairs of socks on a monthly basis. Foot Cardigan pricing is extremely simple: $9 per month. You can gift wrap your socks for an extra $2 per month. Shipping is free, and you can save money and get a free month by paying for a whole year upfront.Sock Fancy prices start at $11 per month for a single pair of socks shipped monthly, including shipping. When you get two pairs of socks delivered monthly, you save 15% and the price is $19 per month. When you pay upfront for 12 months, you receive 1 month free. Both Sock Fancy and Foot Cardigan receive extremely strong reviews from the internet community. TrustPilot shows that Sock Fancy reviews 7.4 out of 10 stars. And if you want to see a video review, this YouTuber posts an unboxing of Foot Cardigan and a review. Say it With a Sock is a fun sock of the month club. They carry name brand socks like Happy Socks, Sock it to me, Socksmith, Gallant & Beau, and Richer Poorer socks. The unique part about Say it with a Sock is that you can personalize your style profile. Once you have built your personal sock profile, you choose your billing and subscription plan to receive your socks, which will ship on the 5th of each month! If you browse the Say It With Sock website, you’ll see their broad selection of brand name fun socks that will come included in your sock subscription packages. This is one of the best sock of the month clubs we have come across. Valentine’s Day Sock Subscription Coupon! Say it with a sock this Valentine’s Day! And get a free pair of Socks! Sock Fancy Reviews: The best subscription sock club? The BBB may be “old school”, but they are still a great resource for checking out the credibility of a business. Overall, Sock Fancy doesn’t score well at the moment (a “D-” grade) due to a few delivery issues and failure to respond. GeekDad covers products for – you guessed it – GeekDads. In their positive Sock Fancy review, they note the “sweet looking products” and that the “process couldn’t be easier” to setup a subscription. A simple Google search can uncover even more Sock Fancy reviews. Overall, we love Sock Fancy and encourage you to give them a try! 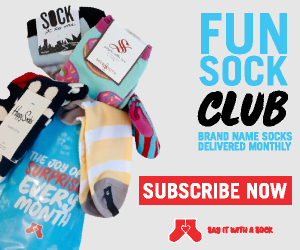 We are 100% dedicated to bringing you the latest news and content related to all things subscription socks and sock of the month clubs. And we know that one of the most common genders to wear socks is the women gender (according to our research, around 50% of all people who wear socks are indeed women). Therefore, below is a list of the top subscription sock sites for women, including sites to buy women’s socks online, and women’s sock of the month clubs. Fun colorful socks are all the rage these days. RenfroSocks is a high quality online site where you can purchase a variety of well known sock brands that fit your fashion needs. RenfroSocks carries both men’s and women’s fun socks, and they have brands such as Dr. Scholls, Carhartt, Fruit of the Loom, and more. Are you looking for high quality fashion socks for both men and women? Check out RenfroSocks.